Concerns about the loss of farmland drive much of the sprawl debate in Michigan. As people move away from densely populated central cities, houses are built to accommodate them in formerly rural areas. Many have argued that this new development is displacing some of Michigan’s most productive farmland. For many people, the loss of farmland is best illustrated by the loss of farms. The number of farms in Michigan fell from over 203,261 in 1900 to just 52,000 in 1997, a 74.4% drop. The largest reduction in farms occurred between 1940 and 1970, the period preceding current farmland preservation efforts, when Michigan lost 106,000 farms. From 1980 to 1990, Michigan lost another 11,000 farms, and another 2,000 farms from 1990 to 1997. The general decline in the number of farms is consistent with trends in the amount of land in farms. More than 19 million acres were in farms in 1920 (see Chart 6). By 1970, total acreage in farmland had fallen by one third to 12.7 million acres. More recently, farmland loss has moderated. In 1989, Michigan had about 10.9 million acres in farms. By 1997, the number of acres in farms fell to 10.5 million, a decline of just 3.7%. This is one-fifth the loss rate of the 1960s and almost one-third the rate of the 1970s. 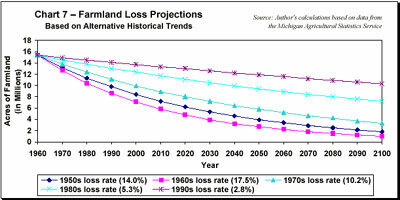 Projections of future farmland losses based on historical patterns are unreliable. For example, Michigan had 12.7 million acres in farmland in 1970. During the 1960s, the state lost 2.7 million acres in farmland. If this acreage loss had been sustained at this same pace, Michigan would run out of farmland within 50 years. In the 1970s, farmland loss moderated to 1.3 million acres over the course of the decade: At this pace, Michigan would run out of farmland within 100 years. Now, at 1990s acreage loss rates, Michigan has more than two centuries of farmland left. Ironically, farmland loss was moderating even during periods when newspaper headlines highlighted urban sprawl and the Governor’s agricultural task force recommended legislative action to protect farmland from economic development. The moderation in farmland acreage losses is even more clearly evident when the rates of farmland loss are compared. During the 1960s, Michigan lost 17.5% of its farmland. At the same rate of farmland loss — land conversion to non-farm uses at 17.5% per decade — the state would have fewer than 2 million acres left in the year 2070 (See Chart 7). Using the most recent trends from the 1990s, Michigan would lose less than 3% of its farmland each decade. If this more moderate rate is more accurate, Michigan would not be in serious danger of losing significant amounts of farmland for a very long time. Furthermore, these projections and estimates ignore the fact that other land — forest, pasture, and even urbanized land — can be converted to farmland and harvested for crops. The latter point is particularly important because the conventional wisdom holds that urbanization is the primary culprit in reducing the amount of land in farms. The reality, however, is quite different. 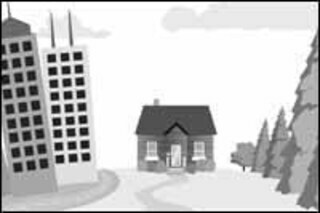 Urbanized land area increased by 194,000 acres in Michigan from 1982 to 1992, a 12.4% increase. Land in farms, however, declined by 854,002 acres (7.8%) during the same period. Even if all land converted to urban uses came from farmland (not used for parks, forests, or other recreational uses), urbanization would account for less than one-quarter (22.7%) of Michigan’s farmland loss. The remaining farmland loss — more than three-quarters of the total loss during the decade — must be related to non-urban causes. Some of the farmland, for example, may have been converted to parks or recreational uses or converted into forest. These trends are also consistent with patterns found nationally. In an analysis of 135 fast growth counties during the 1980s, urban land increased by 37.0% while agricultural land declined by only 2.4%. Even if Michigan farmland were disappearing at increasing rates, state legislators enacted a law in 1974 (Public Act 116) that already protects substantial amounts of farmland from development. The program, subsequently modified in 1996, allows owners of farmland to restrict future development in exchange for tax credits. These "Farmland Development Rights Agreements" are negotiated between the property owner and the Michigan Department of Natural Resources. These agreements limit future development for at least ten years, and as much as 90 years. Forty-one percent of Michigan’s farmland, or 4.2 million acres, is currently enrolled in this program. Another concern raised by many activists is the loss of prime and unique farmland in Michigan. Prime farmland is highly productive as a result of irrigation, location, soil type, and a variety of other criteria. In Michigan, the amount of farmland that is prime is difficult to estimate. Most people believe prime farmland is currently located in the southern half of the state. "Land classified as prime farmland," notes the U. S. Department of Agriculture, "has the growing season, moisture supply, and soil quality needed to sustain high yields when treated and managed according to modern farming methods." Nationally, 24% of rural non-federal land and half of all cropland is classified as prime. About 28% of urbanization uses prime farmland. One third of converted land is non-prime forestland and another 24% is non-prime farmland. Designation as prime farmland, however, does not necessarily imply it is economically productive. Some of the nation’s most productive farmland is not "prime." "Florida and Arizona," the U. S. Department of Agriculture observed recently, "have little prime farmland . . . but these areas rank among the most economically productive in the Nation." A number of important factors influence the productivity of agriculture, including weather, erosion, the use of fertilizers, pesticides, and other technologies.